Mr. GDC, like many, works from home. 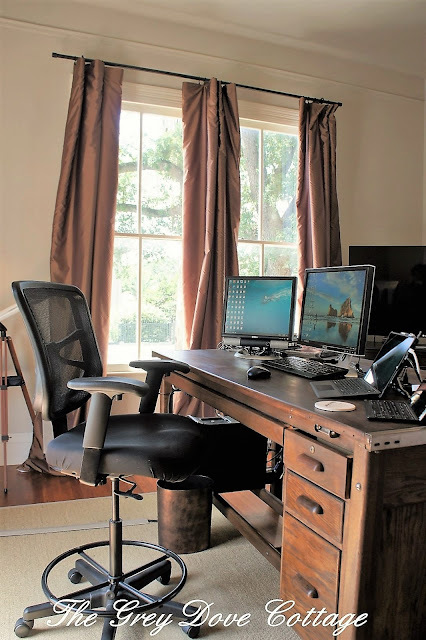 His commute is simple, a few steps through the cottage to his office, where he sits atop a tall stool, at a vintage drafting table. 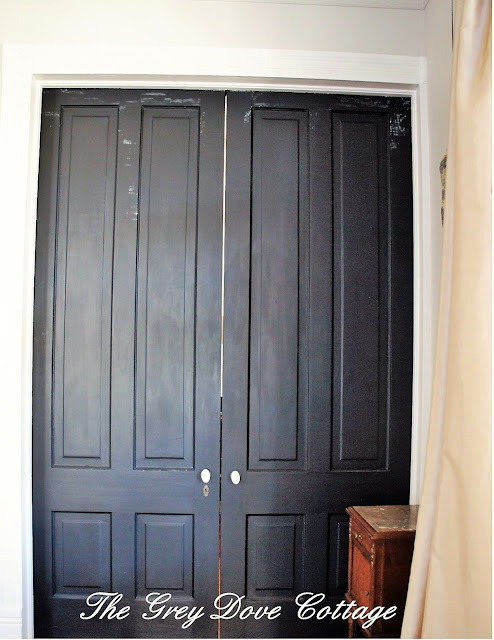 The small room features 12' ceilings, 9' tall windows, a gas fireplace most likely added in the 1930's, along with the only original closet in the cottage, finally original 10' tall working pocket doors adorned with porcelain knobs create the entry. 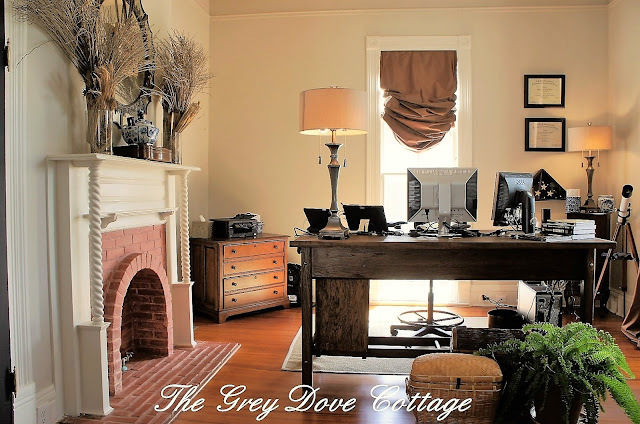 Because he spends so much time in the space, I wanted his office to reflect his personality, to be as comfortable also functional as possible, while working well with the other rooms in the cottage. 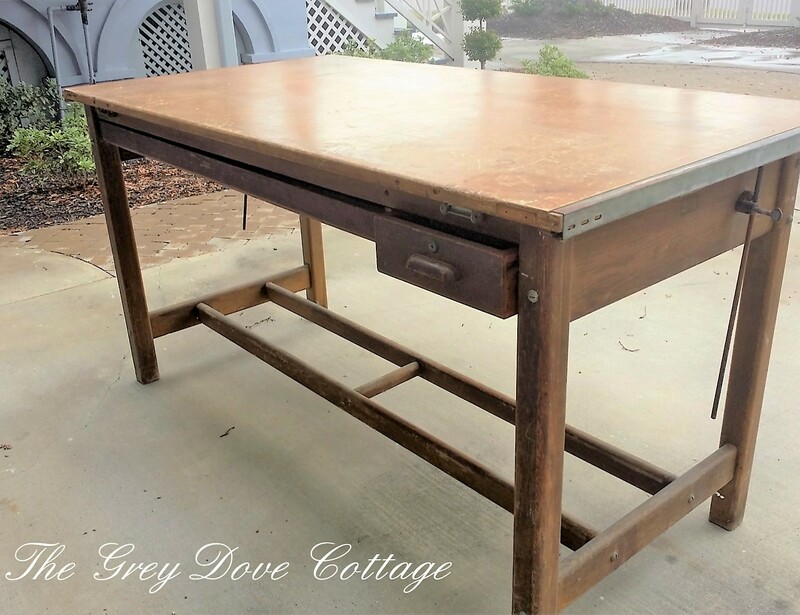 We chose a vintage drafting table to be used as his desk. Found upon Craig's List, it was in poor condition. Originally owned by an architect who passed, the last few years it was cast aside into a garage. Here humidity is high, being stored in a garage it suffered quite a bit of moisture damage. It needed refurbishing. You may read about it's restoration by going here. The height of the desk was a huge appeal, being able to sit atop a stool, or stand without leaning over a desk was ideal. Previously a French farm table had been Mr. GDC's desk, he was accustom to space. The drafting table is a large; 6' by just over 3'. Years before, I sat hours at the same model drafting table, as I made my way through design and architecture school. I knew, from experience, the table would be the right fit. 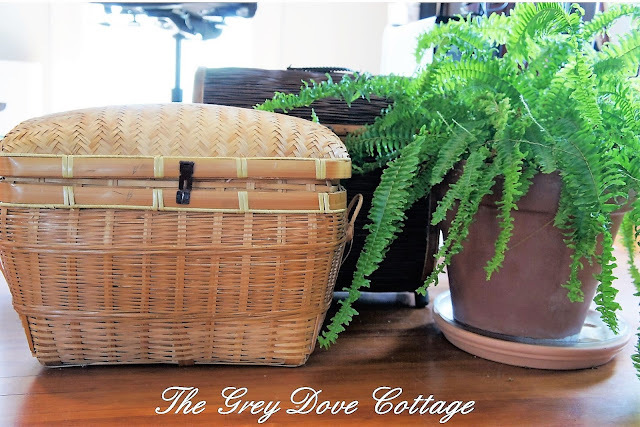 The room sits upon the corner of the cottage, small in footprint, fitting everything Mr. GDC needed into the office was a bit of a challenge. The windows posed a struggle with glare. 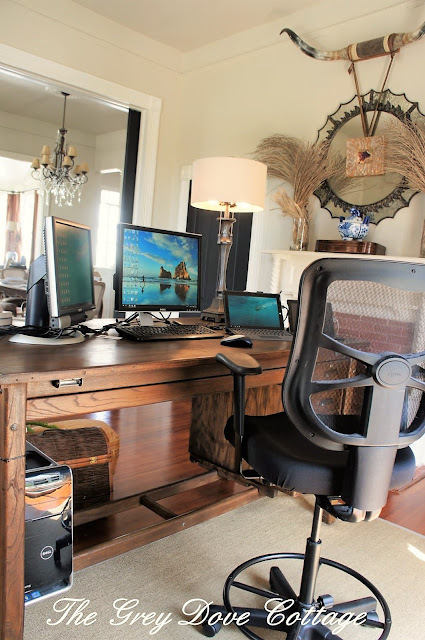 He wanted to be able to enjoy his view, yet control the light, or glare upon multiple computer screens. We chose a combination of drapes, along with a pull shade that measures 12' in length. 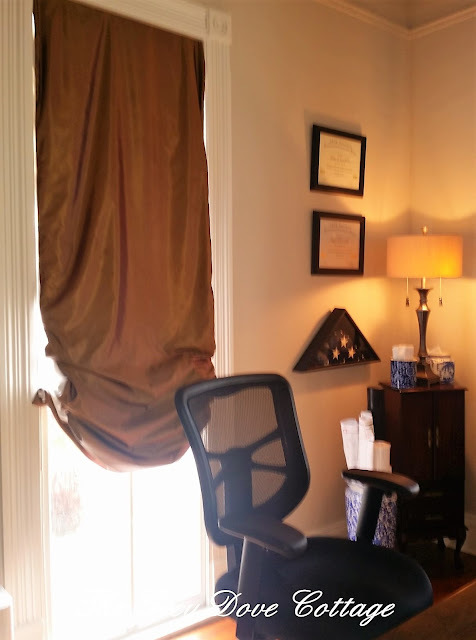 The drapes are easily pulled closed, the pull shade being behind his desk allows height adjustments throughout the day without blocking the view. A vintage jewelry cabinet holds office supplies; paperclips, staples, pens, etc... It's small stature paired with height works well nestled into the corner. Various small drawers work great for office supply organization. 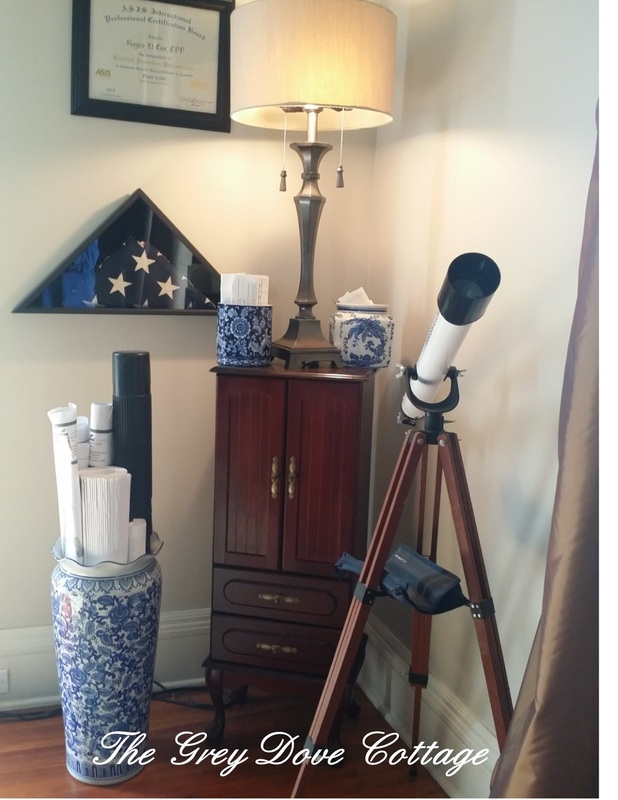 Atop the jewelry cabinet are a collection of blue and white porcelain jars used to organize receipts, etc... A blue and white porcelain umbrella stand store blue prints. 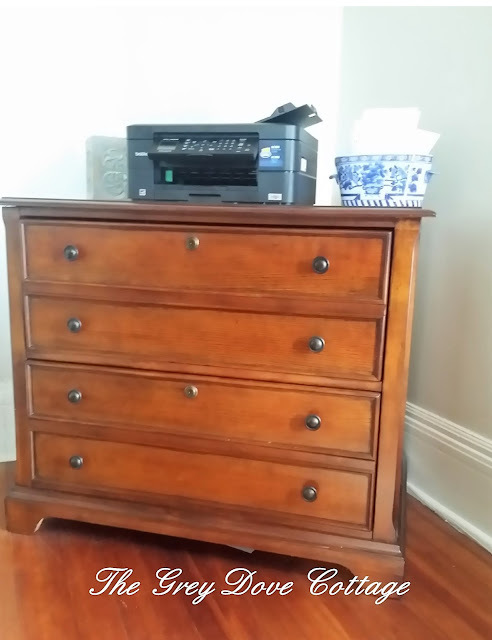 A two drawer filing cabinet, holds files, also the printer, while balancing the opposite corner from the jewelry chest. An oval blue and white porcelain container holds mail. I used blue and white porcelain throughout the space to give a little color. Mr. GDC wanted a masculine, quiet space, the porcelain adds a little shine, color, pattern and interest to an otherwise boring neutral room. 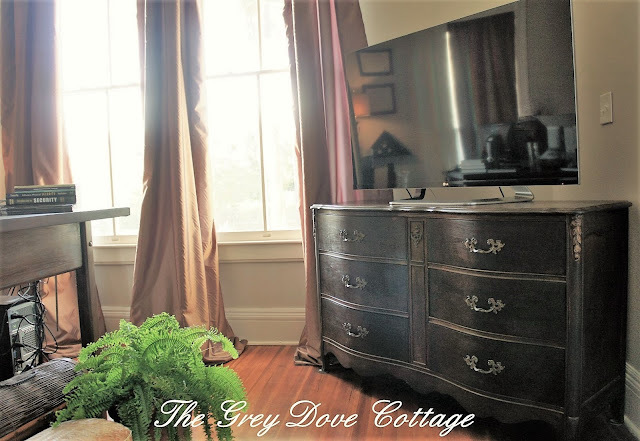 A vintage French Provincial dresser dressed in an espresso finish provides additional storage. A large TV screen for watching old movies when working late, does double duty as a computer screen. 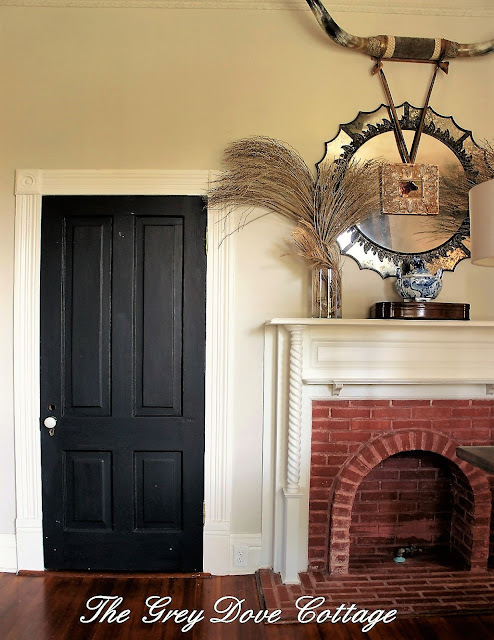 Above the fireplace is a large metal framed starburst mirror, made in Portugal. 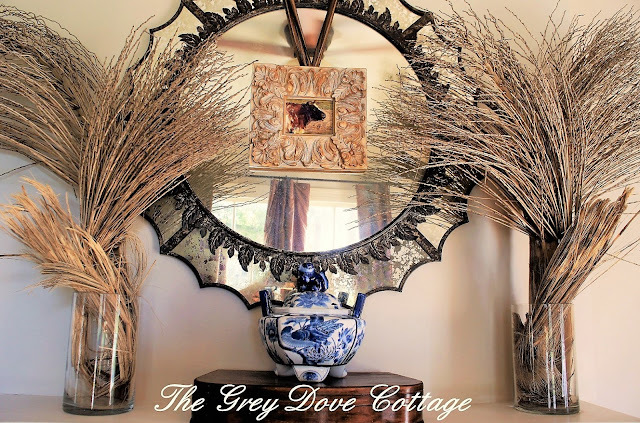 The mirror has a rustic feel. The small leaves surrounding the circular center mirror are a lovely detail. 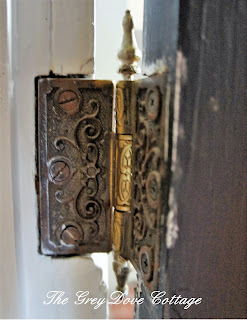 Mirror panels are etched for an aged patina. I adore mercury glass. Layered atop the mirror a small portrait of a cow in a wide, carved frame suspended from satin ribbons, affixed to long horns. Yes, Texas longhorns. 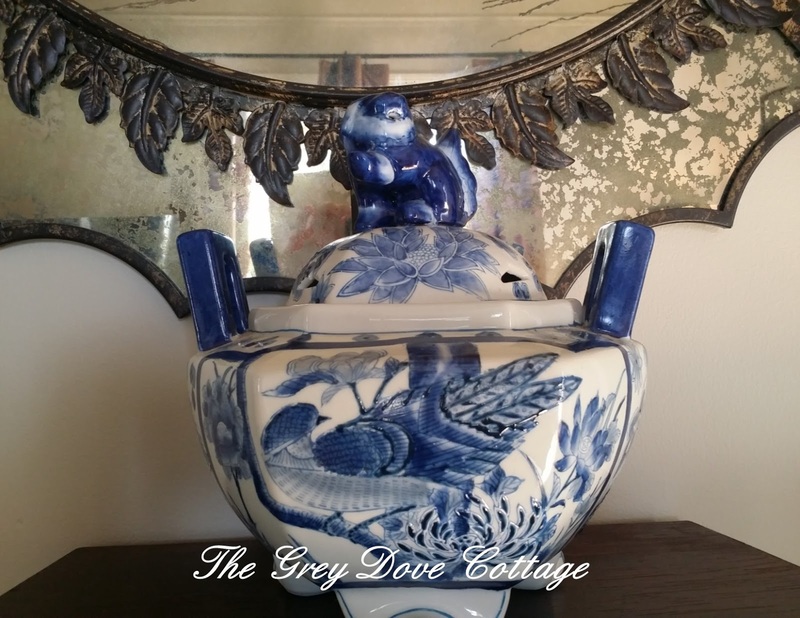 Upon the mantle is my grandmother's silver chest, used for holding a collection of business cards picked up at conventions, trade shows etc... An inherited blue and white porcelain compote featuring a foo dog provides a dash of color, as well as pattern upon the mantel. Clear glass cylinders hold King Palm seed fronds brought inside from the yard. About those horns, gifted to Mr. GDC from a dear friend of mine. 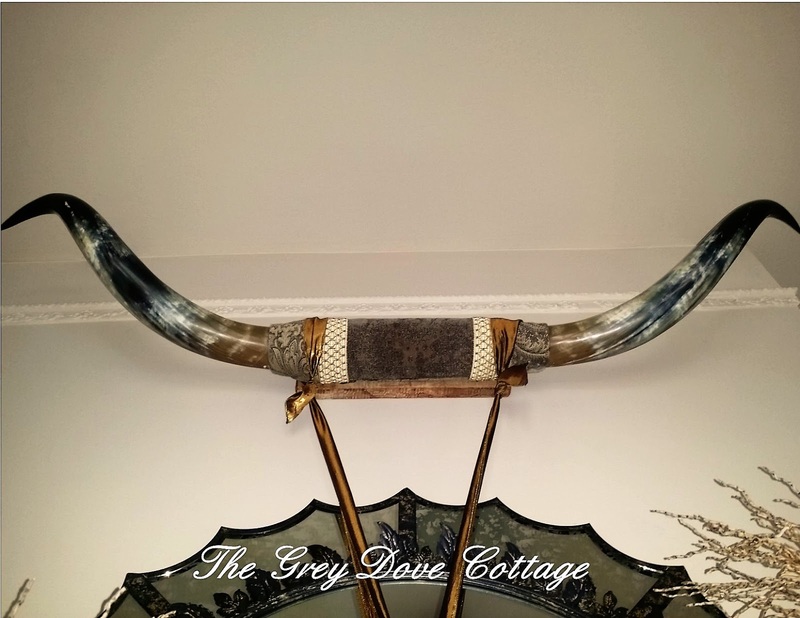 He treasures these horns, at over 6' in length, they are pretty. However, first gifted they wore UT burnt orange leather. Shiver. I recovered the leather with a bit of grey velvet, also grey paisley printed chenille, paired with extra wide flat gimp trim - to make them "pretty". It's amazing what a little fabric will do. I know, bless his heart, he puts up with a lot from me. With storage at a minimum, files rarely accessed are stored in basket trunks. These trunks add texture to the room, as well as anchoring the desk. 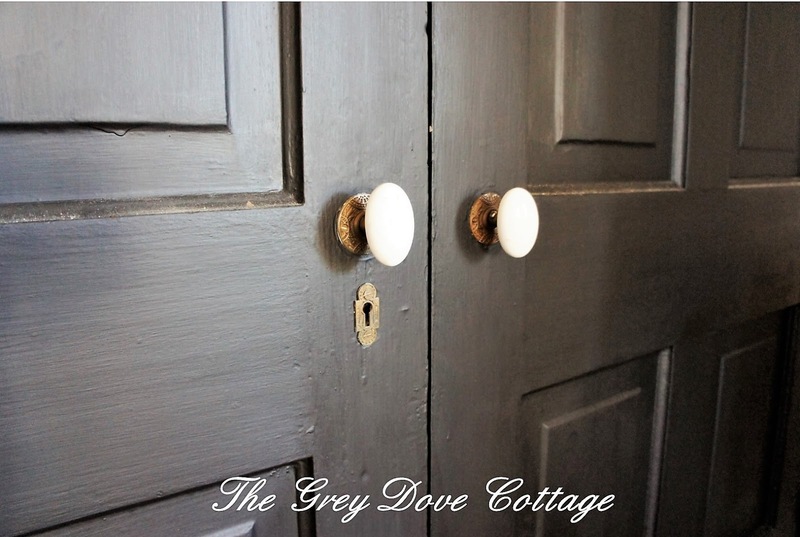 Our cottage is small, many of the rooms open from one to another. 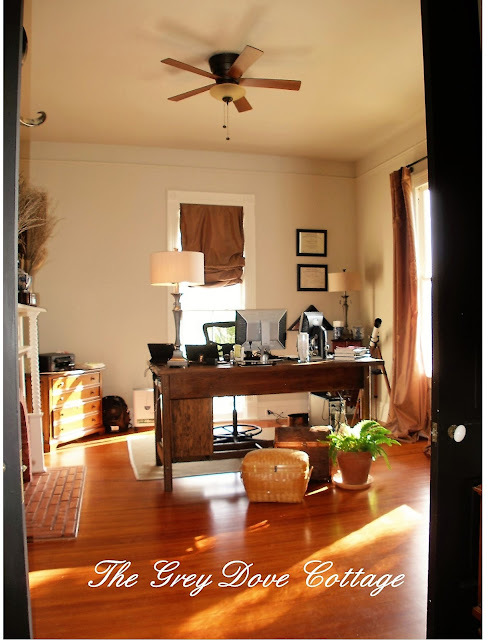 The home office, is directly off the dining room. From the foyer it is in direct view. It was important to me for it to not only be functional, but pretty. 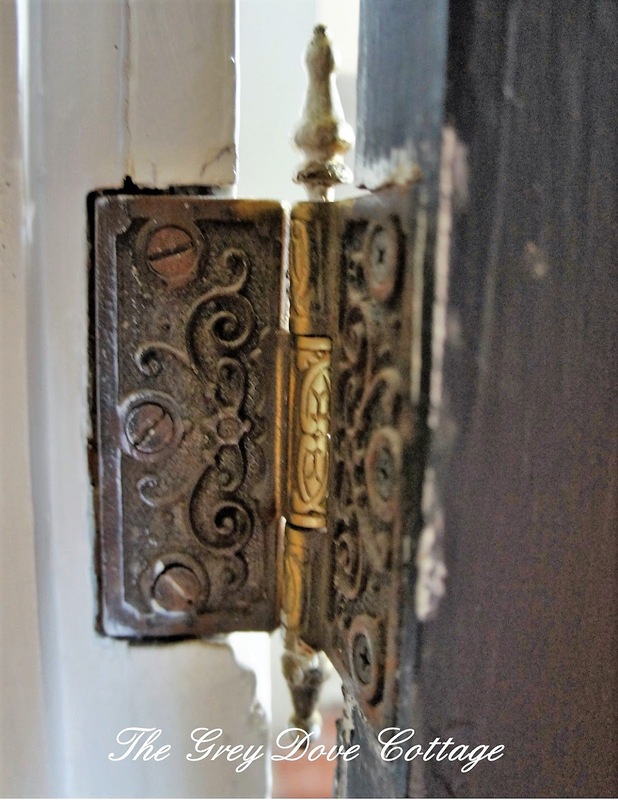 Using vintage pieces paired with modern provides a layered feel to the space, as though it's been collected over time, rather than a project completed in a few months. 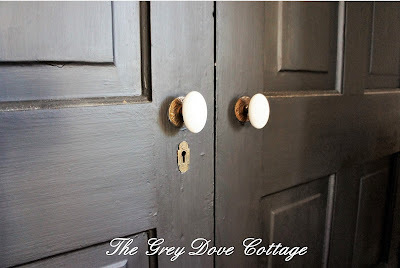 Living in a small Victorian cottage, with little storage creates it's own challenges. Utilizing a vintage dresser, a jewelry cabinet, along with basket trunks, finally porcelain containers, creates interesting storage. Sometimes using pieces in a new way can add a great deal of interest to a space. I hope you enjoyed the Mr. GDC's home office tour.